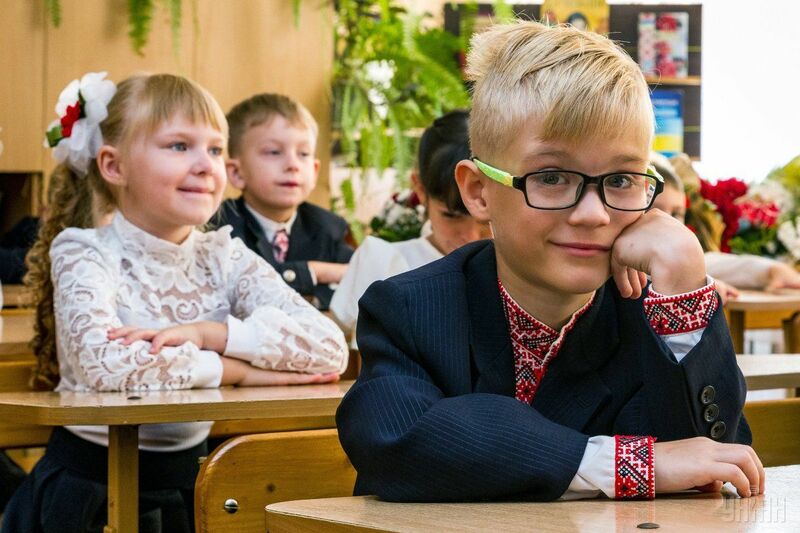 A newly adopted education law introducing a 12-year school system to replace Ukraine's current 11-year school program has become effective. The Verkhovna Rada passed draft law No. 3491-d on September 5 and Ukrainian President Petro Poroshenko signed it into law on September 25. The law establishes that the new system will be adopted at primary schools from September 1, 2018; at secondary schools from September 1, 2022; and specialized (majoring in particular subjects) schools from September 1, 2027. The law specifies that the language of the educational process at schools and colleges is the national language. It is also stipulated that educational institutions, according to the educational program, could teach one or more subjects in two or more languages, namely the national language, English or other official languages of the European Union. Read alsoAccess to education in Ukrainian, Crimean Tatar languages restricted in occupied Crimea - OHCHRStudents belonging to the national minorities of Ukraine are guaranteed the right to study in municipal institutions with the use of the language of a respective national minority along with the state language. This right shall be fulfilled through classes (groups) with instruction in the language of the corresponding national minority. Persons belonging to indigenous peoples of Ukraine are guaranteed the right to study in public facilities of preschool and general secondary education in the language of instruction of the respective indigenous people, along with the state language of instruction. This right is also realized through the creation of classes (groups) with instruction in the language of the respective people along with the state language. Earlier, such EU states as Poland, Romania, Hungary, Greece, and Bulgaria expressed concern over the provisions of the law concerning the language of instruction for representatives of national minorities. Read alsoHungary on Ukrainian education law: "This will be painful for Ukraine"The law states that full general secondary education in Ukraine is compulsory: primary education lasts four years; basic secondary education lasts five years, the period of majoring secondary education is three years. Primary education should start, as a rule, from six years, and children who by the beginning of the school year turn seven must begin primary education in the same school year. The law specifies that higher education shall be received on the basis of complete general secondary education. According to the law, state and municipal educational institutions are separated from the church (religious organizations), operate as secular organizations. Private educational institutions, including those established by religious organizations, have the right to determine the religious orientation of their own educational activity. Also, educational institutions are not allowed to create cells of political parties and form any political associations. The law provides that funds for education worth at least 7% of GDP shall be allocated from the national, local budgets and other sources of funding that are not prohibited by law. State and municipal educational institutions have the right to provide paid educational and other services, the list of which is to be approved by the Cabinet of Ministers. The law stipulates that the salary of an educational worker (of the lowest qualification category) is set at a rate of not less than four subsistence minimums for able-bodied employees. This norm will be put into effect starting from January 1, 2018. Schools will be able to develop their own curricula, introduce syllabi for school subjects in keeping with secondary education standards, and choose textbooks and teaching methods. The number of students per class at general secondary schools should not exceed 30 children, while the number of students in classes in rural schools should be at least five children. If a class has fewer students, lessons shall be held in an individual manner or other forms of teaching. The duration of lessons is limited to 35 minutes in the first grade, 40 minutes in grades 2-4, and 45 minutes in grades 5-12. A principal shall be appointed for a period of six years after competitive selection and could work not more than two consecutive terms.